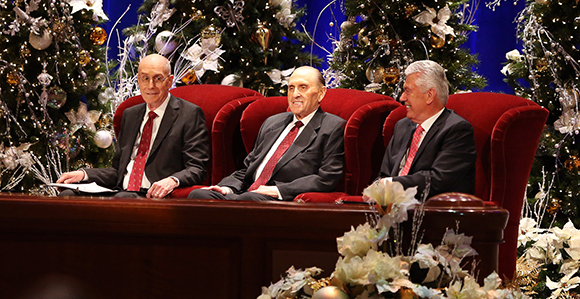 Church members and their friends are invited to participate in the annual First Presidency’s Christmas devotional broadcast on Sunday, December 3, 2017. It will begin at 6pm mountain standard time. The program originates from the beautiful Conference Center in Salt Lake City, Utah and will include seasonal messages and insights from General Authorities and General Officers of the Church. It is a wonderful opportunity each year to begin the Christmas season with Christ-centered thoughts from the Lord’s messengers. Listening to and pondering them can help keep our focus in the right place as the holiday hubbub accelerates. Music will be provided by the Mormon Tabernacle Choir and the Orchestra at Temple Square. A few other stations and websites around the world will also broadcast the devotional program. Be sure to check your local listings to find out what is available in your area. To see previous Christmas devotionals, click here.